Nepal is one of the major Tourist spots in Asia. It is the abode of eight of the ten highest mountains in the world. The magnificent beauty of the Himalayan ranges attracts tourists from across the world to Nepal. 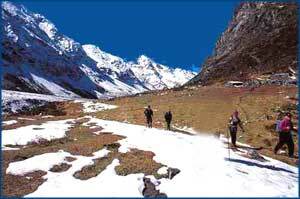 The country is a hot spot for trekkers and mountaineers. Other than adventure Nepal has a lot more to offer. There are many tourist attractions in Nepal. Nepal serves you its vibrant culture, religion and architecture on the same platter. If you are wondering how to reach Nepal, you have come to the right place. Transportation to Nepal is easy and convenient. You can visit Nepal by railways, airways or roadways. Kathmandu, the capital of Nepal, is well connected to all the major cities of the world through airways. There are approximately fifteen international flights plying to and fro Kathmandu. Some of the regular private air careers are Gulf Airways, Druk Air, Biman Bangladesh airlines, Aeroflot, China South West airlines, Singapore airlines, Lufthansa, Air India, Air Sahara, Royal Nepal airlines and Autriair. There are many domestic air services plying within Nepal. Most of the important tourist spots are connected by air ways. Nepal Janakpur Jayanagar Railways operate passenger coaches to eastern Terai. Nepal has many entry points by roads. Some of the most convenient points for entering Nepal by road are the Nepal India border, Dhangadi, Belhiya, Bhairahawa, Kakarbhitta, Mahendra Nagar, Nepalgunj, Nepal china border and Birgung. Public buses ply throughout the country. You can hire cars with drivers to tour the city. Local transports include taxis, tempos, auto rickshaws, bicycles and rickshaws. Bike riding is also a popular form of transport here.